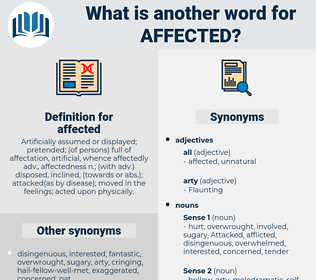 What is another word for affected? Artificially assumed or displayed; pretended; ( of persons) full of affectation, artificial, whence affectedly adv., affectedness n.; ( with adv.) disposed, inclined, ( towards or abs. ); attacked( as by disease); moved in the feelings; acted upon physically. up to ones neck in. unaffected, disaster-stricken, fire-affected, mine-affected, disaster-affected, conflict-affected, flood-affected. effected, ill-fated, hard-hit, distressed, aggrieved, disadvantaged, Discriminated, victimised, disaster-hit, Influencing, exposed, impressed, bereaved, dedicated, impaired, altered, committed, detrimental, worst-hit, mined, allocated, doomed, disturbed, shocked, modified, Crashed, infested, impact, degraded, disabled, involved, Seconded, influential, prejudiced, Trafficked, upset, related, overwhelmed, troubled, wounded, amended, changed, selected, Earmarked, co-located, cause, sensitive. consequences, data, repercussions, commitments, offences, affecting, makes, allocated, impact, IMPACTS, involved, Earmarked. allocations, assignments, periods, sufferers, closures, losers. Detracted, reflected, alter, devastated, Interfered, Benefited, corrected, Contributed, Participated, harmed, jeopardised, disadvantage, Encompassed, undermined, collected, decreased, contacted, weakened, preferred, Relating, directed, contained, Caused, disrupted, pertain, Pertained, impede, impeded, concerning, violated, suffering, Dampened, hamper, permeated, worsened, Impinged, sustained, ffected, hinder, Hindered, Resulted, Infringed, identified, threat, Occurred, inhibited, destroyed, prejudice, about, Involving, faced, Stipulated, transformed, Intervened, relation, classified, change, changing, appropriated, Transferred, Reached, Incurred, modify, led, Explained, concluded, beat, inspired, Enriched, shook, recorded, charged, Favoured, received, Prevented, darkened, touches, Mentioned, Challenged, defined, Weighed, completed, placed, outlined, noted, breached, plagued, Saddened, Was, Were, Into, converted, apportioned, decided, Worked, felt, earned, diagnosed, Came, Declined, amend, Amending, moved, informed, processed, realized, Tasked, per, Encountered, regarding, presented, called, Obtained, HIT, increased, Took, Deployed, Chose, Followed, Happened, struck, handled, by, Entered, Appeared, developed, Questioned, briefings, knock, Knocked, added, applied, Circled, Defended, Dealt, Provided, Endured, sent, pressed, Aimed, spoke, in, blocked, played, turned, fulfilled, appointed, redesigned, invested, allotted, ali, Seemed, swept, put, Had, focused, on, drew, adopted, kicked, landed, Messed, Went, spent, assaulted, Punched, night, wound, Shifted, lit, gripped, Those, Amounted, rose, found, cut, Looked, Met, Killed, Got, effected, made, raised, Did, concerned, Discriminated, exposed, impressed, dedicated, altered, committed, allocated, disturbed, shocked, modified, involved, Seconded, Trafficked, related, wounded, amended, changed, Earmarked. Detracted, exacerbated, reflected, characterized, Inflicted, frustrated, devastated, characterised, Enacted, strucked, incorporated, constrained, Benefited, corrected, Contributed, aggravated, harmed, obstructed, Created, Generated, jeopardised, encouraged, Contravened, Activities, Caught, Deteriorated, distracted, Accommodated, initiated, criminalized, Decimated, traumatized, Subjected, protected, victimized, Overshadowed, undermined, collected, decreased, Contemplated, criminalised, contacted, Excluded, motivated, weakened, preferred, Manipulated, Attributed, directed, Befallen, Curtailed, contained, Caused, restrained, concentrated, invalidated, disrupted, redrafted, impeded, Subordinated, Populations, vitiated, implicated, Hampered, violated, Detonated, disqualified, certified, Dampened, penalized, crippled, demonstrated, dominated, embarrassed, encumbered, neglected, reallocated, diminished, contracted, relocated, Amplified, located, rejected, determined, Tackled, worsened, Impinged, sustained, penalised, Hindered, Resulted, Infringed, traumatised, perceived, integrated, identified, estimated, reinforced, Precluded, lessened, bothered, delayed, confined, Compared, distinguished, shattered, Displaced, Occurred, labeled, inhibited, destroyed, Negotiated, prejudice, tarnished, financed, faced, population, eroded, transformed, Intervened, depressed, adulterated, updated, Captured, mediated, Overtaken, preoccupied, classified, torn, extended, stopped, change, conducted, appropriated, reduced, implemented, Transferred, Reached, engulfed, finalised, Incurred, detailed, deprived, entitled, dented, shaped, respected, offset, Cited, Persuaded, removed, led, Assessed, prolonged, beaten, gathered, Examined, Disappeared, Sacrificed, outposted, Swayed, Bolstered, ravaged, Introduced, untouched, eaten, started, concluded, intervention, declared, Confronted, shaken, Fooled, inspired, distributed, Channelled, overturned, Enriched, opened, donated, established, Begun, stressed, utilized, treated, obligated, Persons, recorded, species, Attacked, charged, continued, dispatched, retained, received, Prevented, commissioned, prohibited, repositioned, imposed, broken, Acted, Tampered, Exempted, Enjoyed, Mentioned, Challenged, Recruited, defined, satisfied, spread, Carried, Weighed, Borne, support, supported, staffed, qualified, Stalled, Been, exhausted, stymied, completed, placed, stated, Embarked, outlined, noted, Filed, breached, absorbed, plagued, Saddened, approved, converted, apportioned, decided, multiplied, Worked, registered, checked, attained, conditioned, adapted, buffeted, tested, felt, earned, come, become, Helped, Managed, lost, replaced, unsettled, diagnosed, Undertaken, considered, Declined, Children, reversed, saved, influenza, amazed, endorsed, annoyed, moved, Exhibited, Meant, weighted, mandated, burdened, governed, devoted, contested, informed, fallen, tagged, processed, Delivered, severed, Mobilized, CODED, washed, realized, beset, Promoted, braked, Tasked, coloured, flawed, reassigned, taken, Encountered, presented, chosen, maintained, called, expressed, Obtained, HIT, realised, increased, embroiled, worn, Notified, Deployed, Issued, tied, assisted, Areas, Followed, ruined, surprised, laid, Happened, recognized, packaged, Disbursed, Sapped, struck, skewed, handled, secured, Entered, backed, Appeared, suspended, Flouted, bound, banned, marred, Scored, diverted, developed, clouded, Ranged, Questioned, released, guided, Performed, scheduled, crewed, Knocked, added, redeployed, applied, reviewed, Prompted, trained, employed, Dealt, Provided, Endured, Spared, appalled, destined, Engineered, set, sent, Aimed, blocked, observed, Discussed, Undergone, Quashed, geared, Launched, region, played, reformed, crushed, netted, turned, granted, planted, Resumed, fulfilled, appointed, redesigned, held, Surveyed, Brought, invested, worried, driven, allotted, Picked, paid, Accounted, heard, Visited, Offered, compounded, swept, pursued, put, reserved, produced, Passed, drawn, Allowed, Had, focused, bombed, seen, Rocked, wronged, embedded, flooded, Accorded, prey, unhinged, burned, Talked, Slowed, adopted, aligned, crisis, punished, Minted, filled, seeded, pledged, kicked, ripped, gone, linked, joined, expended, Claimed, locked, Submitted, Stationed, crowded, Awarded, spent, Flogged, budgeted, Whipped, Supplied, Punched, Lived, ruled, grown, dumped, Shifted, programmed, needed, permitted, risen, packed, hired, known, found, cut, based, Met, requested, Killed, Gotten, Got, funded, effected, problem, done, made, raised, concerned, aggrieved, disadvantaged, Discriminated, exposed, impressed, bereaved, dedicated, impaired, altered, committed, mined, allocated, disturbed, shocked, modified, infested, disabled, involved, Seconded, prejudiced, Trafficked, upset, related, overwhelmed, troubled, wounded, amended, changed, selected, Earmarked. natural, true, real, sincere, genuine. collected, ok, calm, unchanged, unhurt, sane, unmoved, unimpaired, uninjured, happy, unperturbed, kept, healthy, untroubled, unswayed, hard. down-to-earth, uninterested, right, disenchanted, authentic, humble, homely, mousy, apathetic, hostile, impromptu, uncontrived, shy, instinctive, antagonistic, estranged, quiet, meek, impulsive, unassuming, unstudied, timid, bashful, smooth, spontaneous, disaffected, unrehearsed, easy, indifferent, cool, unconscious, unassertive, scornful, reserved, retiring, antipathetic, diffident, overmodest, averse, demure, bona fide, realistic, modest, effortless, unforced, alienated, allergic, passive, lowly, contemptuous, disdainful, unprompted, extemporaneous, disinclined. Lady Emily was affected the most. But I do not quite see how I was affected by it - more, I mean, than others, archdeacon. abashed, abscessed, affixed, avesta, apposite, abject, avocado, avocet, abscessed tooth, affect, apostate, abused.